A still day, gasoline vapors and a cabin boat - this firefighter with the San Diego Lifeguard Service has unwittingly found himself in the middle of an explosive combination. According to a January 1998 article on CNN, the firefighter shown in the clip was covered in protective clothing. The veteran firefighter jumped into the water and safely picked up by one of his colleagues. 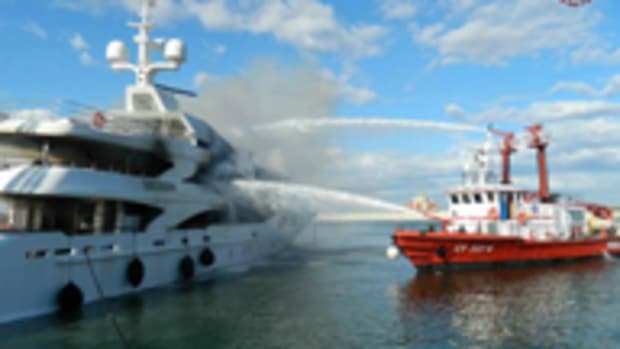 Another reality television show captured a serious vessel fire more recently. The crew of CMT&apos;s original series "Danger Coast" was on board a Miami-Dade fire rescue boat April 6 in Biscayne Bay when the call came in that a 56-foot Carver was engulfed in flames. Camera crews filmed as the yacht, Kemosabe, burned to the waterline and sank; the two crewmembers were rescued. The two delivery crew were taking the 2002 Carver to its home port of Naples, Fla., when they smelled something burning, according to an article in the Miami Herald. One crewmember checked the engine room and found the fire; he was unable to extinguish the blaze. (Click here for information about operating a fire extinguisher on board.) The crew had time to issue a distress call and put on their PFDs before abandoning ship, according to the report. "Danger Coast" follows the Miami-Dade County&apos;s waterborne Marine Operations Bureau. The show premieres at 9:30 p.m. April 9 on CMT.